Shiva Takes a Stand (On You)! As a professional yoga teacher, sometimes it’s easy to forget how strange some of the Hindu statues on display around yoga studios can appear to people unfamiliar with them. But each statue tells a story and invites us into a deeper relationship with ourselves and in a way that adds depth to the yoga postures. Understanding these statues, like the Shiva Nataraj, can helps us understand ourselves and our own conscious evolution. I often ask students if there are any injuries or requests before practice so I can be sensitive to the needs of my students. Once a woman raised her hand and asked, “I don’t have a pose to request but . . . um . . . why is that guy standing on a baby?” pointing to the five-foot statue of the Shiva Nataraj, the Royal Dancer, on the altar of our studio. I replied that the statue represents the dance between us and the cosmos as we uncover the secrets of our hearts to evolve into our highest beings. And since we are on the topic, how about we put in Natarajasana or Royal Dancer’s Pose into the mix of our practice. Shiva represents the creator of the universe. Like many statues representing Hindu gods, he has many arms which depict his many tasks, each one with an invitation or admonition guiding us along our own personal evolution. He is the god-amalgam of consciousness and movement, of order and chaos. He is grinning as his hair is literally on fire, riding the wave of chaos in the universe. This is your invitation, just like the statue. 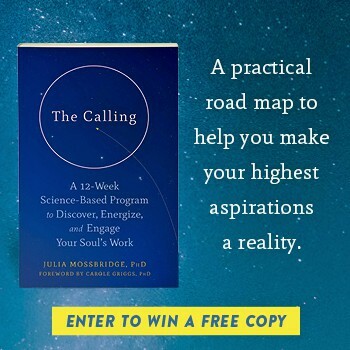 I’m asking you to step up, connect to your heart, and courageously make your next bold move. It’s not easy. There’s work involved but I’m confident that as you connect body, mind, and spirit, you will grow into the next stage of your life with confidence and presence.